Went for a bike ride this morning before getting it packed up on the cargo rack. 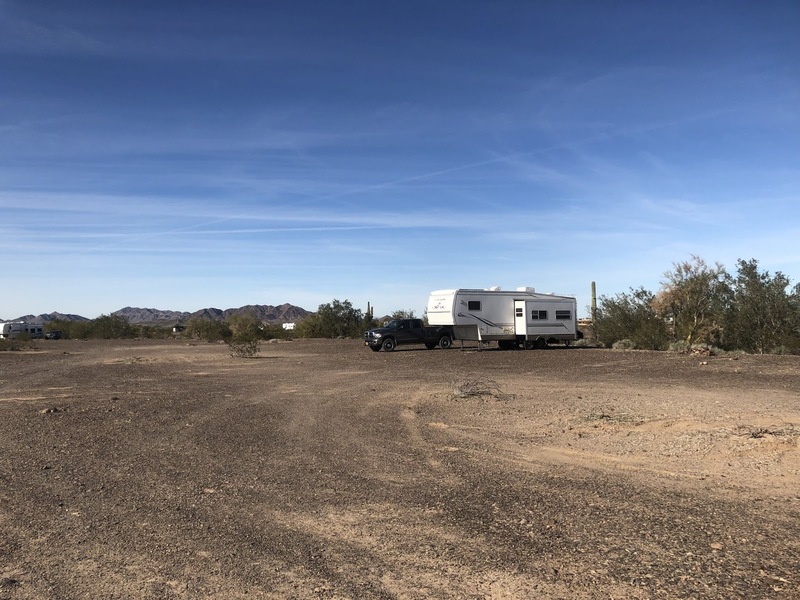 The Roadrunner BLM area has about a 20th the number of the RVs when compared to last week. 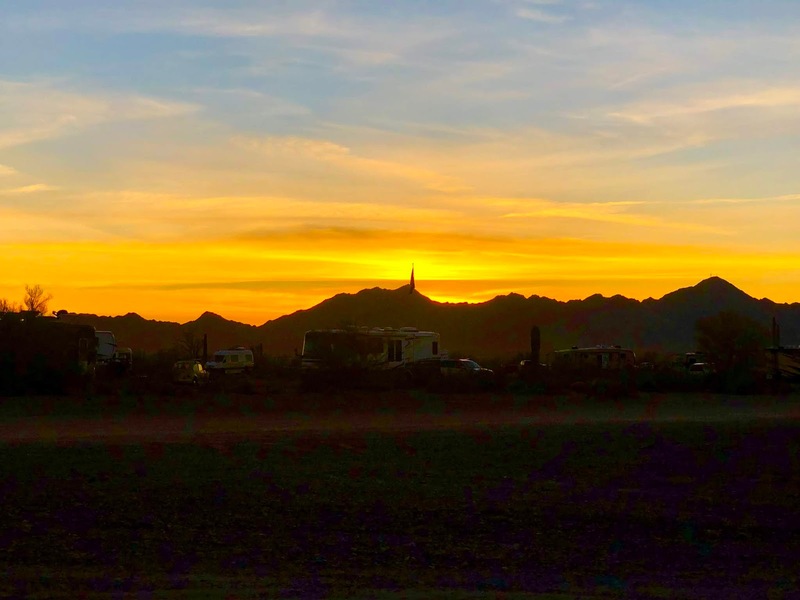 Most of the Quartzfest participants have left and the few that are left are taking down their antennae and packing up. Compared to a few days ago, we are all alone out here now. This picture is Sunday afternoon right after we returned from a meet-up with YouTubers David and Jenni. Their channel is called FateUnbound and they live in their trailer full time with a large dog, two cats and a rabbit. They were in the BLM area right next to I-10 which felt a lot more crowded than here at Roadrunner. Probably due to its proximity to the RV show. BTW, the RV show is now over and there was no longer a traffic jam at the intersection. It’s almost 70°F today with a light breeze. Nice enough to sit outside and type this post. We finally were able to dump our trash. The transfer station north of town is only open Sunday through Wednesday and closes at 2:30pm. Pretty limited hours which probably explains why every single dumpster in town is filled to overflowing. Even though everyone is supposed to pack out their trash, they don’t. The LTVA’s were all really crowded. Since they have trash service and dump stations, they are a more popular option for many RVers. 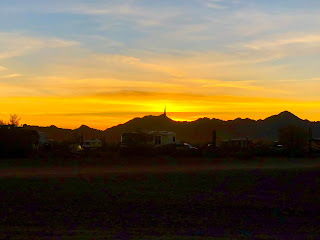 This is our last day in Quartzsite and we didn’t really get to explore much for several reasons. But mostly, there were just too many people everywhere. 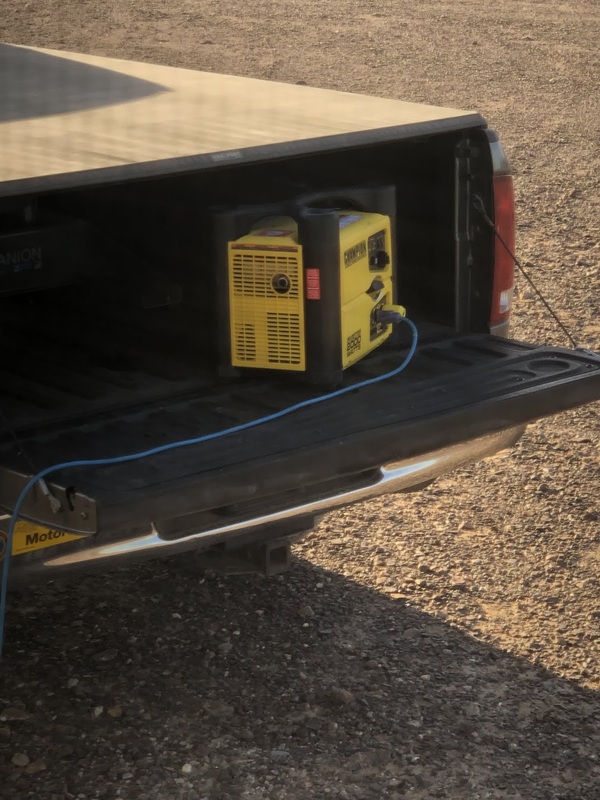 I guess one of the benefits of having neighbors in the BLM campground is that I don’t worry about leaving stuff out such as the generator. Now that there is noone else around, I felt compelled to put it into the back of the truck again. 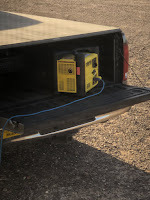 One of the things that this last week has highlighted is that there is nothing wrong with running the generator. This evening, I’m making a roast in the Instant Pot and it has to run for over an hour total. Yes, I could run it off of. the battery bank but why stress over the battery charge level at the end of the day. Just run the generator. Especially out here where the next RV is probably a couple of hundred yards away. And when you run it in the back of the truck, the noise is pretty contained. It’s really nice now that the crowds have gone. Extremely quiet especially at night. Wait till you find a spot where there's no one around for miles.....that's the best. Even this was good. No complaints about Sunday. I barely heard anything. Feels the same only quieter.